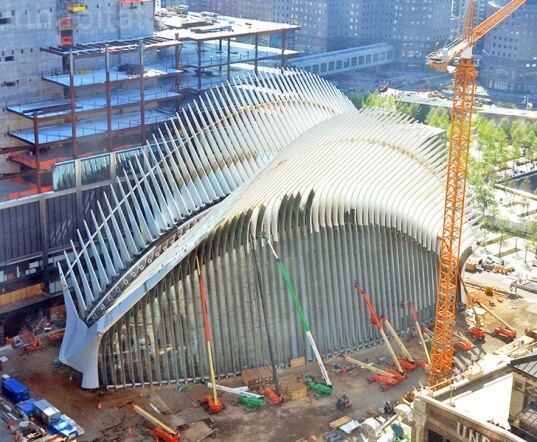 New Yorkers have anxiously awaited the long-overdue opening of the World Trade Center Transit Hub, designed by famed Spanish starchitect Santiago Calatrava, and today the world got a glimpse of what's to come at the Oculus. Platform B at the World Trade Center Port Authority (PATH) Station in New York City opened quietly today and we got a first look at this stunning transit station, which is already infamous as "the most expensive train station in the world" at over $4 billion, and the structure is still not yet complete! Crews scrambled last night painting and cleaning to get the station ready for its big reveal, and we feel like this design was worth the wait. The opening of this portion of the "Oculus" not only provides New Jersey commuters with a spacious new platform for their commutes, but it also reveals the full immensity of the awe-inspiring Calatrava structure. 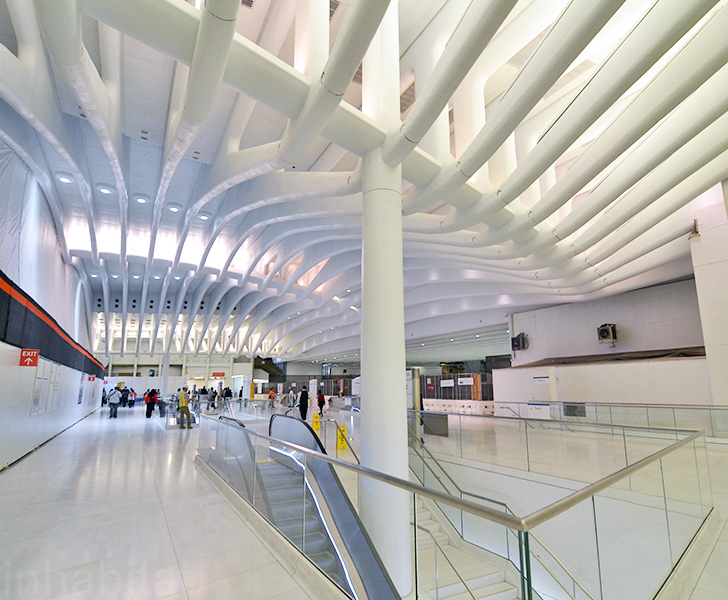 Inside the new station, travelers can finally get a look at the vaulted, ribbed underside of the famous (er… infamous?) structure, which looks like glowing ribs from the inside of the body of a bird. Although the first portion of the station opened last spring, until now, travelers couldn’t really see much of the new Calatrava ceiling. The entire space from ceiling to floor is wrapped in white marble, with clear glass fitting in between the ribs of the ceiling, giving the entire hub a bright, open and clean feel – a stark contrast to the usual dark, closed-in platform station that commuters around the country are familiar with. The station is part of a grander transportation hub called the Oculus, a massive space that will host over 200,000 commuters and travelers every day. The hub sits on the World Trade Center space previously occupied by the Twin Towers and, with a cost of nearly $4 billion (more than 3X the original budgeted price), has become known as the most expensive train station in the world. Two more stations in the hub will open over the next few weeks, the existing temporary station that was built after the 9/11 attacks will be dismantled and removed. The entire space from ceiling to floor is wrapped in white marble, with clear glass fitting in between the ribs of the ceiling, giving the entire hub a bright, open and clean feel - a stark contrast to the usual dark, closed-in platform station that commuters around the country are familiar with. The Oculus is currently under construction. This is the second station to open at the WTC site. Inside the new station, travelers can finally get a look at the vaulted, ribbed underside of the famous (er.. infamous?) structure, which looks like glowing ribs from the inside the body of a bird. Santiago Calatrava Oculus World Trade Center PATH Platform opening. The station is part of a grander transportation hub called the Oculus, a massive space that will host over 200,000 commuters and travelers every day. Santiago Calatrava Oculus World Trade Center PATH Platform elevator. Two more stations in the hub will open over the next few weeks, the existing temporary station that was built after the 9/11 attacks will be dismantled and removed. Although the first portion of the station opened last spring, until now, travelers couldn't really see much of the new Calatrava ceiling. Two more stations will open by the time construction has completed. Santiago Calatrava Oculus World Trade Center PATH Platform staircase. 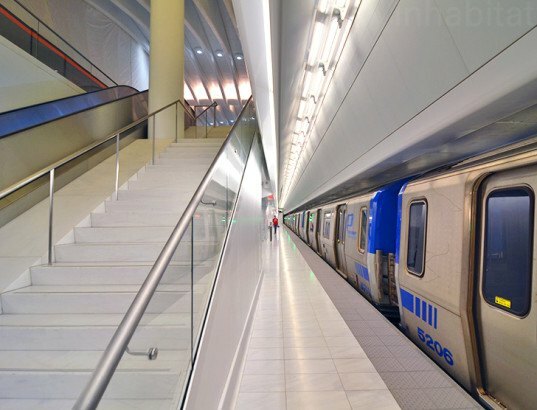 The hub sits on the World Trade Center space previously occupied by the Twin Towers and, with a cost of nearly $4 billion (more than 3X the original budgeted price), has become known as the most expensive train station in the world. The space is bright and open, in contrast to the typical dark, crowded platform. Santiago Calatrava Oculus World Trade Center PATH Platform escalator. The infamous structure has been controversial for its design and well over-budget price tag.